Carmela here. I've been on a blogging break for much of this year, busy working on other projects, both personal and professional. (I have continued behind-the-scenes as our TeachingAuthors blog administrator, though, so I haven't been completely out of touch.) 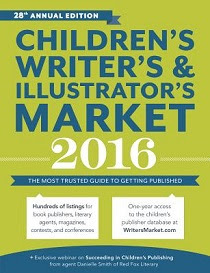 Today, I'm back to celebrate the publication of two of my articles in the just-released 2016 Children's Writer's and Illustrator's Market (also known as the CWIM) edited by Chuck Sambuchino (Writer's Digest Books). At the end of this post, you'll have the opportunity to enter for a chance to win your very own copy of the 2016 CWIM (courtesy of Writer's Digest Books)! 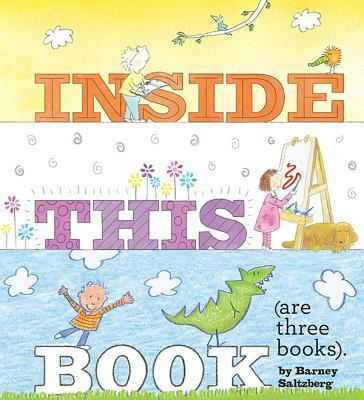 Since today is Poetry Friday, I'll also be sharing a poem--an excerpt from Barney Saltzberg's new picture book Inside this Book (Are Three Books), published by Abrams Appleseed. One of my articles in the 2016 CWIM is an interview with Barney, who is an amazing author, illustrator, singer, and songwriter. More about him and his new book below. First, I'd like to talk a little about my other article in the 2016 CWIM: "Make a Living as a Writer." For "Make a Living as a Writer," I invited four traditionally published trade book authors who are also successful freelancers to share their experiences and advice regarding ways to supplement book royalty income. The four authors included my fellow TeachingAuthor, JoAnn Early Macken, former TeachingAuthor, Laura Purdie Salas, author and writing coach, Lisa Bullard, and scientist-turned-children's author, Vijaya Bodach. The article includes their tips on landing work-for-hire assignments, balancing work-for-hire with other career goals, and preparing submission packages for educational publishers. The SCBWI Blueboards, where there's a board specifically for "Work for Hire & Calls for Submissions"
Laura Purdie Salas's book: Writing for the Educational Market: Informational Books for Kids. Over the next few weeks, my fellow TeachingAuthors will continue the conversation on this topic by sharing their own advice related to finding supplemental income. And Laura Purdie Salas will return to post a special Guest Wednesday Writing Workout on September 30, called "Is Writing on Assignment Right for You?" If this topic is of interest to you, be sure to enter our giveaway so you can read more about how to "Make a Living as a Writer." Even if you're not looking for ways to supplement your writing income, you'll want your own copy of the 2016 CWIM for my interview with the amazing Barney Saltzberg, along with all the other helpful articles, interviews, and market information! "Inside This Book is a tribute to self-publishing in its most pure and endearing form. Three siblings create three books of their own using blank paper that they bind together (in descending sizes to match birth order). One sibling's work inspires the next, and so on, with each book's text and art mirroring the distinct interests and abilities of its creator. Upon completion of their works, the siblings put one book inside the other, creating a new book to be read and shared by all. The second sibling in the book is named Fiona. She is "an artist and a poet," so her "book" is filled with poetry. In honor of Poetry Friday, here's an excerpt from Fiona's section of Inside this Book.
. . . Can you tell I love to rhyme? I play with words all the time. I write a poem every day. My new favorite is “Who Wants to Play?” . . .
"Readers may well be empowered to write their very own stories or books." Be sure to check out today's Poetry Friday roundup over at the Poetry for Children blog AFTER you enter our giveaway drawing. Use the Rafflecopter widget below to enter to win your own copy of the 2016 Children's Writer's and Illustrator's Market , You may enter via 1, 2, or all 3 options. If you choose option 2, you MUST leave a comment on TODAY'S blog post. If your name isn't part of your comment "identity," please include it in your comment for verification purposes! The giveaway ends October 10 and is open to U.S. residents only. Thanks for this blog! I've always enjoyed children's books and am interested in writing and getting published as a children's author. Hi Carmela, Nice to see you back, and congratulations on the article. Funny that I was just finding articles in my 2015 copy of this book. And I love Beautiful Oops!, will look for this new book by Barney Saltzberg. The coming posts sound good, too! Happy autumn! Waving hello to you, Linda. ~~~ I LOVE all of Barney's books. I hope you enjoy INSIDE THIS BOOK. Thanks for sharing, I'll pass the info. on to members of my SCBWI-IL critique groups. Great info, thanks so much. My name is Jason and I love children's books and have a few ideas of picture books of my own! Thanks, Louann, and welcome, Jason! Welcome back, Marti!! And, such a great post! Thank you so much for sharing your wisdom!! Sounds like a very useful article, Carmela. And Inside This Book sounds charming. Congrats on your article in CWIM. I'm looking forward to reading it. I will be looking for Inside This Book. It looks pretty clever. Thanks for the post and the chance to win. TWO articles in one edition of CWIM? Whee! I'm looking forward to reading your interview with Barney Saltzberg when I read through the entire CWIM. Congratulations! Welcome back, Carmela, and thanks for sharing all these great resources. Congratulations on all YOUR contributions, too! Thanks Bobbi, Possessky, and Buffy. Rosi, you're right, INSIDE THIS BOOK IS very clever and fun, too. I think children will really enjoy it. I know, Laura, isn't it cool! Thanks again for your help with the article. I forgot to say: good luck to everyone entering the giveaway! So much packed into one post! Thank you, Teaching Authors, for sharing. You're most welcome, Kristi. Thanks for stopping by! What an interesting concept for a children's book! Looks like it would be the kind of book you discover something new with each read. Thank you for the recommendation and loads of good information. You're most welcome, Cat Ami. Thanks for stopping by! Congrats on the articles! I always enjoy reading this blog. Thanks! Congratulations on the articles! Always great info packed into the CWIM. Good to think about ways to creatively diversify one's writing career. Love this blog and all the articles. Keeps me informed and keeps me going. Of course, I would love to win this book because my library doesn't carry it. I love learning about new markets. Thanks for the post and the chance to win CBWI 2016. Katie and Sandie, so glad you find our blog helpful. Cathy, Michele, and Wendy, if you're new to us, I hope you'll return. Michele, thanks for helping to spread the word about the giveaway. A big thanks to all of you for making time to comment! Congratulations, Carmela, on having 2 articles in CWIM! That's awesome. Thanks for linking to my website in the information. I like to be helpful to as many writers as possible, so I always appreciate it when people spread the word. Your website is a GREAT resource, Evelyn. Thanks so much for keeping it updated with so much helpful info. And thanks for stopping by. What a great site!! So excited to have found it! I love this site for the great information it contains! The tips and introduction to books & authors I wouldn't know about otherwise are valuable to me. Thank you all! Great Information! Thanks so much for this series. Looking forward to more. I don't always have time to read every post here but the ones I do read are always helpful. Thank you for the giveaway and congratulations! Congrats on the articles in *the Bible* of children's publishing. I've combed through many an edition! This is great! Love the info. Can't wait to read the book. I love these books. Looking forward to this one! Thanks for the post! I am to read the links now...there is lots of great,helpful information here for a writer wanting to branch out! Sara and David, we're glad you found us, too! Jane and Teresa, we're happy to know you find our site helpful. Betha317, hope you enjoy the rest of the series. Thanks for the congratulations, Keri. Kari, JB, and Elizabeth, thanks for taking time to comment. I heard about this post at Laura Purdie Salas' blog. Writers Market helped me find my first sale. A great resource. This is such a great resource to have. Thanks for the giveaway! Welcome, Linda! Thanks for stopping by. Dena and Fernanda, you're most welcome. Thanks for the feedback! Thanks for the roundup of interesting links and goodies -- I am putting "Inside This Book" on my shopping list! Congratulations, Carmela! and thanks for all the great links and info. Kaylea, so happy to know you'll be checking out Barney's book. Thanks, Peggy. Hope you find the info helpful! I've found it impossible to make a living as a writer so far, so I'm very interested in reading your article and the forthcoming posts on Teaching Authors. Thanks, Carmela! Rebecca, if you haven't read our two subsequent posts from Esther and Laura Purdie Salas, I hope you will soon. And I hope you find them helpful. Thank you for the amazing links and information. Excited about give-a-way as well. I'm excited to find another great blog to follow. Great article and great information as well. Thanks for the information on finding supplemental income too! Appreciate the giveaway and happy publishing, everyone! What an awesome post! And the article in the book sounds amazing too. McMarshall, thanks for stopping by. Claire, we so happy you found us! Hello, Nancy, JEN, and Barbara. Welcome to our blog! to searching through your archives. I took a couple of classes with Barney many years ago - not only talented, he's a great person too! Love this book within a book within a book concept and the love of books it embodies. Thanks for the chance to win the most recent copy of CWIM! Just found this blog - really interesting article. I look forward to reading more posts! I am an illustrator starting out in South Africa, so I am sure I will find this site useful. Holding thumbs for the competition. This was such an interesting, helpful, not to mention entertaining post. Thank you so much, from Deborah Fletcher Blum, coordinator SCBWI Hollywood Mingle (formerly Schmooze) meeting monthly at the LAPL Fairfax Branch. Thanks for stopping by, Heidi! Good luck to you, and to everyone else entering the giveaway. bberleythewordsmith, so glad you found our blog! Pauline--I agree about Barney being a GREAT person. He was very generous in his responses to my interview questions. Joanna, so glad you enjoy the concept behind Barney's new book. Mrs Beckerling, I'm so glad you found us. I hope you find the blog helpful. If you're in South Africa and entering the giveaway, please remember that you need to have a US mailing address to qualify. Deborah, so glad you enjoyed the post. A big shout-out to all our fellow SCBWI members in the SCBWI Hollywood Mingle! Welcome back, Marti. Thanks for this article and for all you do. Hi Deborah ~~~ Thanks for stopping by. Welcome back to you, Carla. Hope you had a great trip! I am so grateful for all of the information that you share so generously! It has helped me so much, and it keeps me writing. Thanks for stopping by, Ed and Lois. I wish we could give copies to everyone who entered!